SUMMARY: Deciding how to cultivate new revenue streams and increase the return on traffic depends a lot on a news publisher’s experience and financial security. However, even though today’s two-sided revenue model is the best point of departure for converting traffic into revenues, it has built-in inefficiencies. The result is that many news publishers’ return on traffic can be increased by also cultivating alternative revenue streams. In this blog post, I describe the potential inefficiencies of the advertiser-subscriber revenue model and outline three approaches to cultivating alternative revenue streams. The two-sided revenue model adopted by most established news publishers has generated much-needed revenue growth in digital news publishing. This revenue growth is likely to continue at a moderate pace as news publishers further improve their core offerings to users and advertisers, continue to optimise the balance between their free and paid-for content, and become better at recruiting and maintaining subscribers. However, regardless of these important efforts to improve the advertiser-subscriber revenue model, for most news publishers, the return on traffic spent to generate advertising and subscription revenues decreases with amount of traffic spent. The simple reason is that demand for advertising is not unlimited while overexposure of paid-for content for news publishers results in a lower effect. 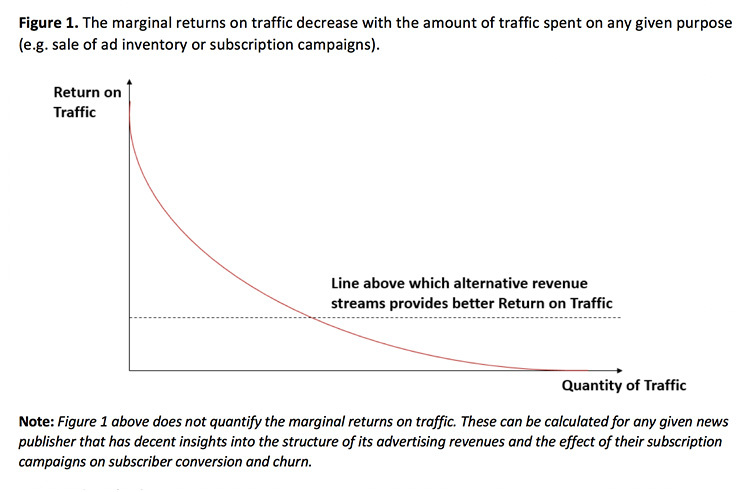 The result of the decreasing marginal returns is that, at some point, alternative revenues streams will yield better returns than spending more traffic on generation of advertising and subscription revenues, as illustrated hypothetically in the figure below. The amount of traffic that can be better monetised with alternative revenue streams will naturally vary between news publishers but will generally be larger for news publishers with high levels of traffic. Ekstra Bladet is an example of such a high-traffic news publisher, as is Bild in Germany, VG in Norway, and Aftonbladet in Sweden. To cultivate new revenue streams, news publishers have to develop new offerings that can generate better marginal returns on traffic than advertising and subscription sales. Usually (and unfortunately), launching new journalistic offerings is a low-yield business for which reason cultivating alternative revenue streams most often requires news publishers to get out of their comfort zone. The new offering must benefit and gain competitive advantage from using a portion of the news publishers’ traffic for marketing. For publishers of general news, the consequence is the new offering should address a consumer market (B2C) and preferably be popular in the publishers’ user segment. Offerings that fall in this area include digital market places, price comparison services, and daily deals services. The new offering should be able to generate a considerable profit from adoption in the publishers’ country or region. The reason is the value of the news publisher’s marketing (and thus the competitive advantage the publisher provides) is reduced significantly, if the offering requires international scale to be competitive. This makes many of the tech platforms that are hyped in the start-up scene for their global potential less attractive to news publishers, even if such platforms attract massive attention from venture capitalists. Unless a news publisher has very deep pockets or a willingness to mediate risk via multiple investments, the new offering should have a clear path to profitability via increased marketing without yet being fully mature. This rules out early stage offerings (radical innovation) that do not (yet) have proven market traction and mature offerings that are very expensive to acquire or compete with. 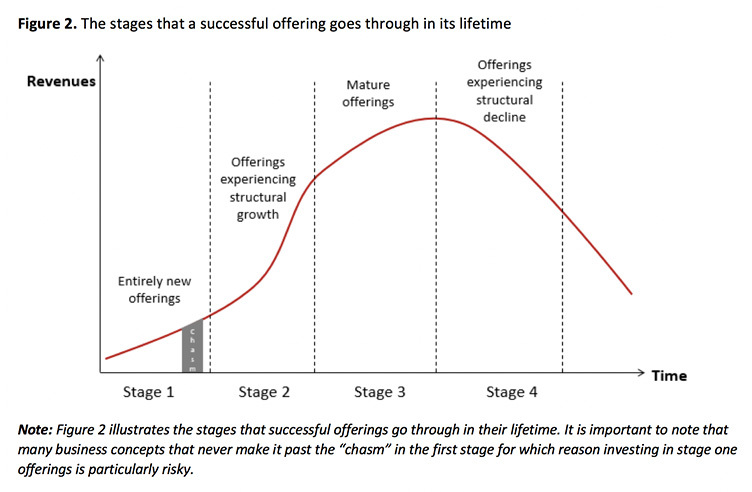 There is a standard process of stages that successful offerings go through in their lifetime. 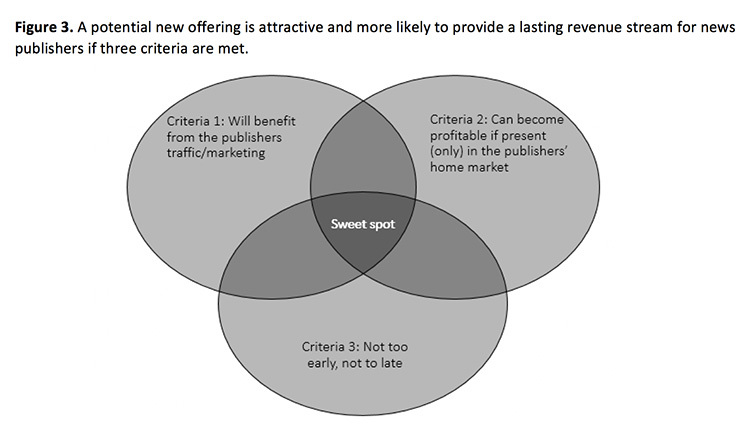 An offering meeting the first two criteria and is in stage two of its development (criteria three) is in the sweet spot with the greatest chances of success. How to cultivate alternative revenue streams: build, buy, or barter? When new potential revenue streams from attractive offerings are identified, they must be cultivated. As mentioned above, cultivating new revenue streams requires getting out of one’s comfort zone, developing new competencies, and taking risks — something not all news publishers are ready to or should do. 1. Build: Building a new offering matching the three criteria described above by oneself is likely to be the most difficult approach to establishing new revenue streams. This is because it requires both investment of capital and competencies that only few news publishers have. However, the potential rewards are significant, as the news publisher will reap all the value generated by the new offering without having to share with founders or co-owners. Publishers engaged in building new offerings should, however, be ready to accept failure and potentially engage in more than one project to mediate risk, as not all initiatives are likely to succeed. 2. Buy: Buying a share of a firm that produces an attractive offering does not necessitate competencies and capabilities in building new offerings. However, it does require capital investment and, in particular, if a majority share is acquired, the ability to steer growth businesses in general and in the product market of the offering specifically. For these reasons, limping in via acquisition of a cheaper minority share can be a natural first step that also allows for gaining deeper insights into the offering and the team behind it before potentially investing more. 3. Barter: Finally, investing marketing in return for equity in a firm producing an attractive offering is a less expensive and less risky approach to cultivating new revenues streams. The reason is the cost to the news publisher is limited to the opportunity costs associated with the traffic spent on marketing of the new offering. However, this approach is likely to limit the size of the share that can be acquired and narrow the field of potential firms to invest in to fairly early stage start-ups that cannot yet afford to buy marketing at the scale they need to grow. Whether build, buy, or barter is the right approach to cultivating new revenue streams and increasing the return on traffic depends on the individual news publisher. Those with a lot of experience and deep pockets may opt for a structured “build approach,” involving the development of multiple new offerings via an owned and operated incubator or accelerator. Risk-averse publishers with deep pockets may opt for a “buy approach” by acquiring minority shares in firms with attractive offerings while increasing the investment once the ability to achieve stable growth has been proven. Finally, for risk-averse publishers with less money to invest, a “barter approach” based on marketing for equity deals can provide good opportunities for establishing relationships with new partners before — perhaps — making a bigger investment.